From The Colorado Independent's Andrea Tudhope. 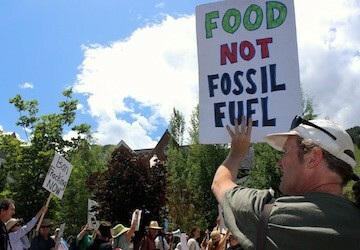 ASPEN– This tiny resort town, set high above the heavily plied natural-gas fields of the Colorado Front Range, was the unlikely scene on Saturday of the latest clash in the running battle in the state over the controversial natural-gas-extraction method known as fracking. More than 100 anti-fracking protesters gathered outside the Democratic Governors Association meeting held here, waving signs, shouting slogans and staging street-theater scenes in an attempt to draw the attention of Governor John Hickenlooper and the other “important state leaders and presidential hopefuls” in attendance. For Charles Bucknam, who joined the protest from Parker, the question was telling. “The government has the responsibility to let the people know what’s going on,” he said. Fracking, or hydraulic fracturing, is a process that blasts millions of gallons of water mixed with sand and chemicals deep into the earth to loosen up trapped gas. The protesters are concerned that the public health effects of fracking have been downplayed and that the way the heavy industrial activity has been allowed to spread into residential areas of the state will result in illness and depressed property values. They say putting the interests of the drilling industry over environmental health and safety runs against hard-won Colorado values. They add that people come here for the outdoor lifestyle, for the clean air and the stunning Rocky Mountain landscape. The protest comes on the heels of news that the state’s Oil and Gas Conservation Commission, with Hickenlooper’s approval, joined a lawsuit filed by drilling companies to override a ban on fracking passed by voters in Longmont last year. 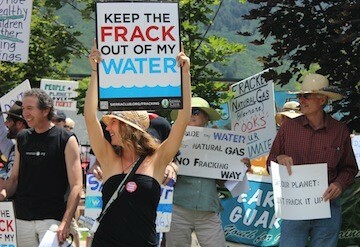 The ballot initiative banned fracking within the city limits and was supported by roughly 60 percent of city voters. Longmont, about a four-hour drive from Aspen, sits on the eastern plains atop the Wattenberg Field, one of the largest natural gas fields in the country. Hickenlooper, a former oil-and-gas-industry geologist, has worked to defend fracking. He sees it as an innovative process that will boost the use of natural gas over coal, arguing that gas is a cleaner “bridge” fuel spanning the time from now to an era when renewable energy will mostly fuel the nation. He opposed the Longmont ban because he believes it’s the state’s responsibility to make a comprehensive set of regulations for the industry to follow. Bucknam agreed. “[Hickenlooper] represents the industry instead of the people,” he said. “We’re taking it into communities that are getting fracked that don’t really know what’s happening to them, don’t know why they’re getting sick, why they’re getting skin rashes, why they’re getting nose bleeds and headaches and cancer,” he said. 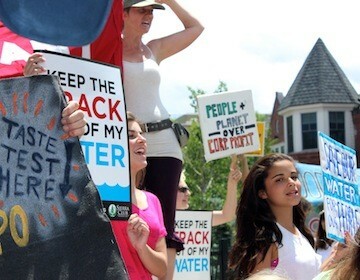 Among the protesters, or “fracktivists,” were representatives and volunteers from groups that included 350 Colorado, Frack Free Colorado, Food and Water Watch, Garfield Transparency Initiative. 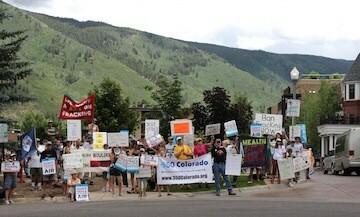 The protest was organized by Protect Our Colorado, a coalition fighting to protect Colorado from drilling and fracking. Health concerns are the top priority for the activists. 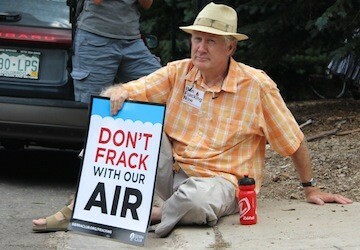 In reference to the U.S. Senate committee meeting in 2012 where Hickenlooper claimed fracking fluid was safe enough to sip, the protesters brought in Hickenlooper look-alike Mike McLoughlin, Denver-based actor and electrician, for a dramatic interpretation of fracking-fluid taste-testing. Former cell biology professor at NYU, Virginia Black, now a Longmont resident, is mystified by the government’s loose approach to regulating the process. “I don’t understand why chemicals that I could not pour down the sink for fear of contaminating water and air would not be regulated… in fracking. Those are massive amounts of chemicals,” Black said. A woman named Phyllis from Paonia said she felt an urgency to join the protest.